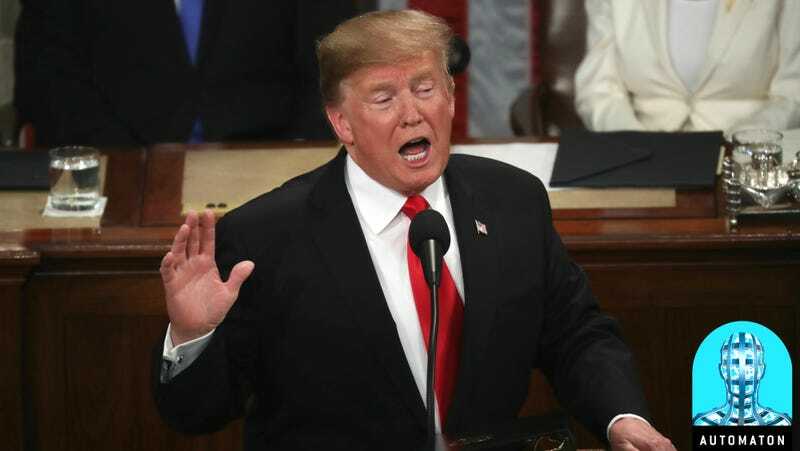 WASHINGTON, DC - FEBRUARY 05: President Donald Trump delivers the State of the Union address in the chamber of the U.S. House of Representatives at the U.S. Capitol Building on February 5, 2019 in Washington, DC. President Trump’s second State of the Union address was postponed one week due to the partial government shutdown. The first substantive claim President Donald Trump made in his second State of the Union address concerned what is perhaps his favorite non-Wallean topic: blue-collar jobs. If there are two professions that Trump has awkwardly and effusively embraced during his tenure as president, it’s coal and manufacturing—you know, salt-of-the-earth jobs. Manly jobs. American jobs. Disappearing jobs. As usual, there is self-aggrandizement, exaggeration, and gaslighting at work here, but on this topic the bluster aligns more squarely with conventional wisdom, which makes it doubly important to contravene. Because the vast, vast majority of blue collar manufacturing jobs—those mythical jobs that have become a favorite fantasy of Trump conservatives and a political football for plenty others—well, they are not coming back. Automation has made sure of that. First things first: That 600,000 jobs number is kind of a mystery—fact-checkers have flagged it as fishy, and according to the Bureau of Labor Statistics, it’s about 170,000 jobs too high. Still, over the last two years, some 436,000 new manufacturing jobs have been created. But the job that Trump is probably picturing while he bloviates—a grease-stained blue collar worker on the assembly line—doesn’t look a whole lot like most of the actual jobs that the economy has added. He’d only have to check in with his own BLS to see that. “Much more capital intensive and much less labor intensive” means, essentially, more automation. The factories have been mechanized, and the new jobs they offer (operating and overseeing the machinery) tend to require more education. And as much as Trump loves to blame bad trade deals for the loss of American manufacturing jobs, automation has contributed much more to their decline than globalization. “It’s not even close,” as Lawrence Katz, a Harvard labor economist, once told the New York Times. So, if and when Trump does secure new labor guidelines in his updated NAFTA deal—like those necessitating a higher percentage of auto parts be manufactured in North America and that Mexico recognize labor unions to render competition fairer—the factories that will benefit will likely add few blue collar jobs back to their labor pools. Trump just never talks about automation—it is entirely possible he is completely oblivious to the debate over its impacts and more likely he has waved it away in a meeting once in favor of continuing his narrative of deal-making the manufacturing sector back into being. Which may explain why his pledged efforts to restore the American manufacturing sector—like, say, Trump’s support for the coal industry in a world wracked by climate change—are so out of date and poorly aligned with reality. By some counts, defense jobs now make up 10 percent of manufacturing demand. It’d take a fuller accounting of the durable goods manufacturing sector to understand the full scope there, but it’s telling that, for the moment, it is not Trump’s trade dealing or his tax relief that’s driving the growth in factory jobs—it is the ever-expanding military industrial complex.